Create flower arrangements to decorate your home and to help celebrate the festive season. In this one day course, you will learn to make gorgeous wreaths and table displays using both traditional and contemporary techniques. Fresh flowers and accessories provided. 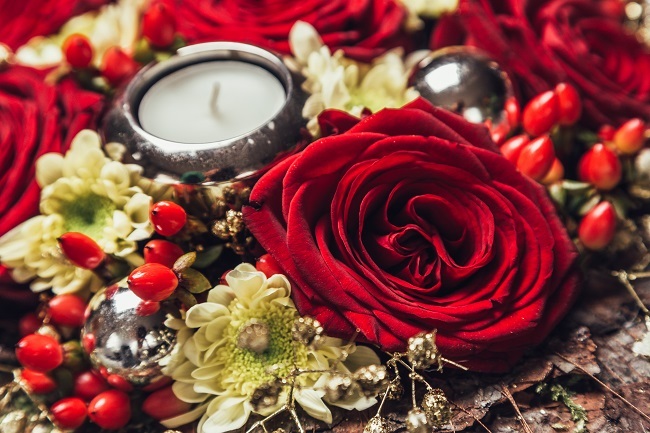 In this course we will create a traditional event wreath for door or table, and a Christmas day centrepiece using seasonally available flowers. Each participant will take home their own creations. Each of our floral design courses is a designed to be stand-alone and explores a different aspect of floristry. How to use seasonal flowers and foliage, plus ornaments, to create a wreath and a table arrangement suitable for Christmas. These skills will be transferable to other floral arrangements. All materials are supplied but you can also bring along your own foliage and flowers or small Christmas decorations to supplement your arrangement if you wish. Bring your lunch as this course runs over lunch time. Tea and coffee will be available in the staff room.